The db file sequential read wait event has three parameters: file#, first block#, and block count. In Oracle Database 10g, this wait event falls under the User I/O wait class. Keep the following key thoughts in mind when dealing with the db file sequential read wait event. The Oracle process wants a block that is currently not in the SGA, and it is waiting for the database block to be read into the SGA from disk. The two important numbers to look for are the TIME_WAITED and AVERAGE_WAIT by individual sessions. Significant db file sequential read wait time is most likely an application issue. The db file sequential read wait event is initiated by SQL statements (both user and recursive) that perform single-block read operations against indexes, rollback (or undo) segments, and tables (when accessed via rowid), control files and data file headers. This wait event normally appears as one of the top five wait events, according to systemwide waits. Physical I/O requests for these objects are perfectly normal, so the presence of the db file sequential read waits in the database does not necessarily mean that there is something wrong with the database or the application. It may not even be a bad thing if a session spends a lot of time on this event. In contrast, it is definitely bad if a session spends a lot of time on events like enqueue or latch free. This is where this single-block read subject becomes complicated. At what point does the db file sequential read event become an issue? How do you define excessive? Where do you draw the line? These are tough questions, and there is no industry standard guideline. You should establish a guideline for your environment. For example, you may consider it excessive when the db file sequential read wait represents a large portion of a process response time. Another way is to simply adopt the nonscientific hillbilly approach—that is, wait till the users start screaming. 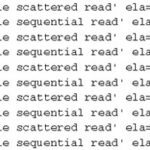 Learn more about how to minimize waits on db file sequential reads in Part 2 of this article. Thanks for the article. No thanks for not providing the query in copyable text.